Update 11/17, 2PM ET: Since I first posted this yesterday, all 17 Beatles albums on iTunes have moved into the top 50 albums, from Abbey Road at No. 7 and Yellow Submarine at No. 47. 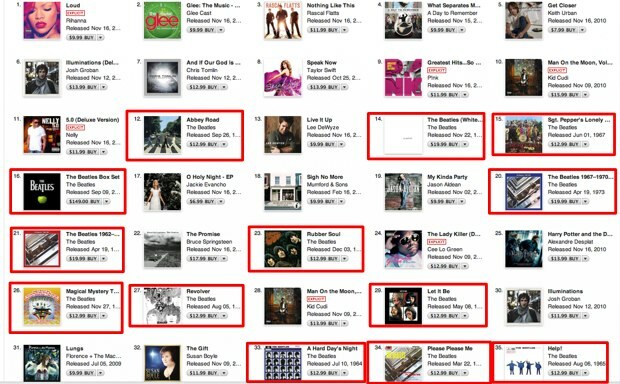 Obviously, there is a lot of pent-up demand for the Beatles on iTunes. Decades after their last album, they were still the third best-selling music group last year, and that was without any digital sales. Since going live on iTunes for the first time this morning, all 17 albums are currently in the top 100 best selling albums on iTunes. And 15 of them are in the top 50. The best selling Beatles album is Abbey Road, currently at No. 12, followed by the White Album (no. 14), Sgt. Pepper’s (No. 15), and the $149 Box set (No. 16), and moving up the charts fast. The least popular Beatles albums? Yellow Submarine (No. 72) and Beatles Fior Sale (No. 57). In contrast, only 6 of the top 100 songs on iTunes are from the Beatles. “Here Comes The Sun” (No. 53), “Let It Be” (No. 56), “Blackbird” (No. 67), “In My Life” (No. 69), “Come Together” (No. 89), “and “With A Little Help From My Friends” (No. 97). People are definitely buying the albums instead of singles. This kind of impulse buying is to be expected on the first day the Beatles are available, especially with all the media coverage around the sale of these albums. But will a Beatles album take the top spot before the week is out? And how many of these will remain in the top 100 through the holidays?